When the English actor Henry Irving completed his highly-acclaimed American tour in April 1885, a group of prominent men hosted a farewell banquet in his honor. 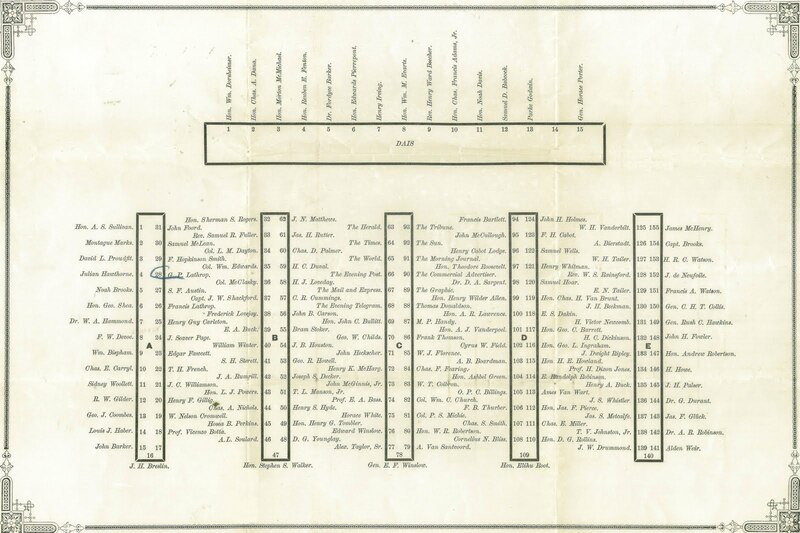 Those who paid to attend this subscription dinner received an admission ticket, a menu card, and a seating chart, where some of the prospective attendees may have been surprised to see the names of two of the guests—Henry Ward Beecher, the aging Congregationalist minister once opposed to the theater, and twenty-six-year-old Theodore Roosevelt who left New York the previous year after his wife and mother died on the same day. 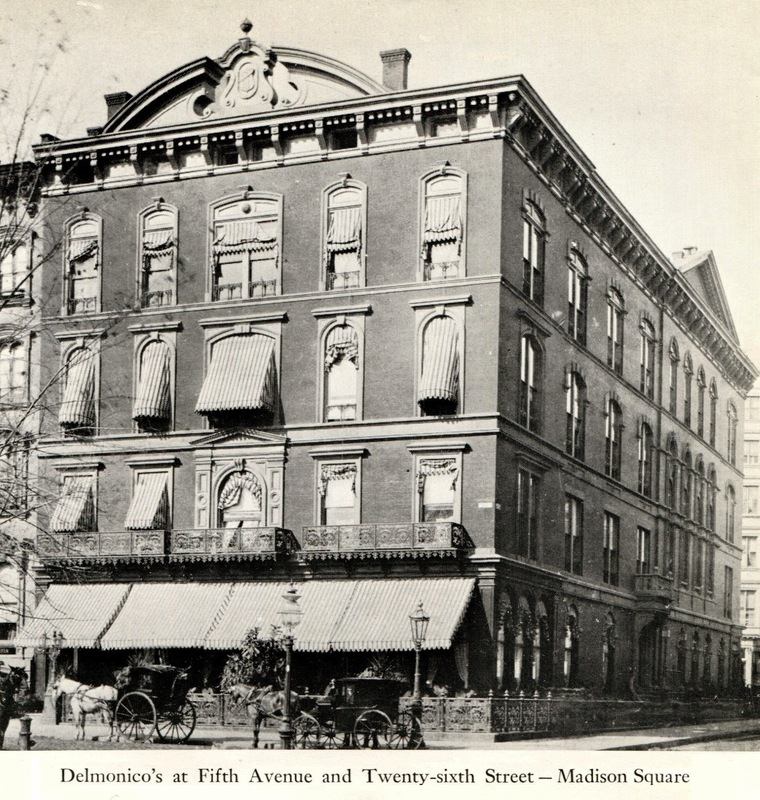 The dinner was held at Delmonico’s fashionable restaurant on 26th Street, located between Fifth Avenue and Broadway on Madison Square. For this special occasion, the third-floor banquet room was decorated with British and American flags; Colorful flower displays adorned the dining tables and a miniature theater made of sugar was placed at the center of the dais. As usual, the dishes on the menu were based on traditional French cuisine. 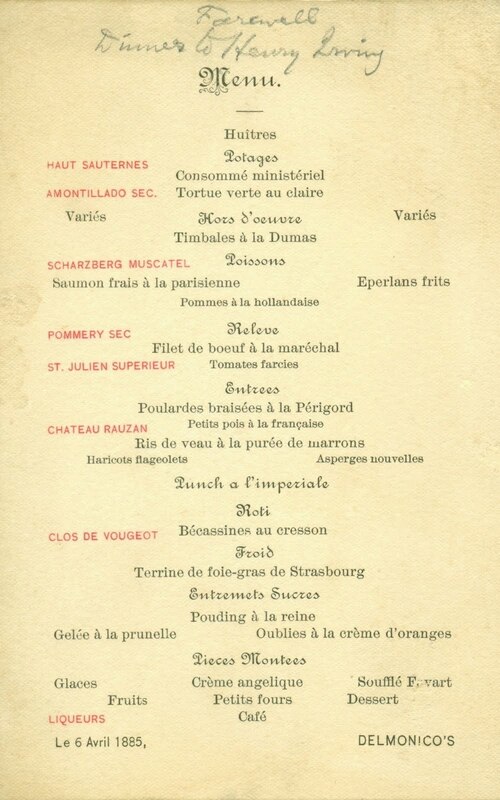 The entree poulardes braisées à la Périgord was prepared by trussing a neutered hen with thick slices of truffles under the skin, and then roasting the fattened bird on a spit over a fire. Other dishes were less complicated to prepare. The game dish bécacassines au cresson was simply roasted snipes served with watercress. 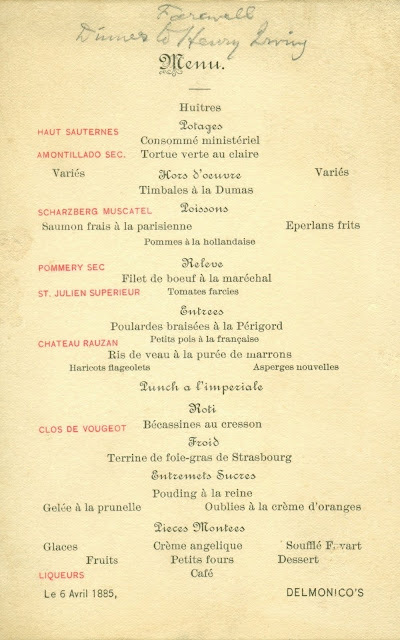 Chef Charles Ranhofer developed the recipes for some of the dishes served at Delmonico’s, such as timbales à la Dumas. Named after the French writer, this hors d’oeuvre comprised small, cylindrical-shaped molds of chicken forcemeat decorated with truffles and slices of tongue. 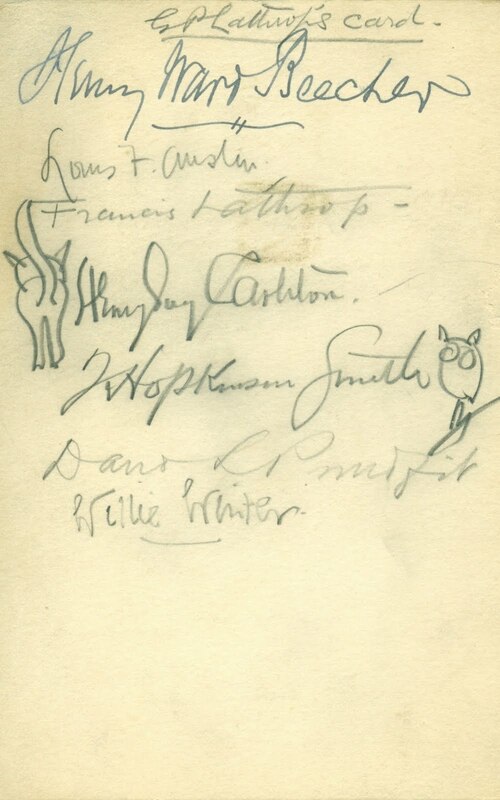 Poet George Parsons Lathrop wrote his name on the back, insuring that his menu card would be returned after being passed around for autographs. Other than Henry Ward Beecher, most of those who signed his card were seated nearby, such as his brother Francis, an artist who decorated the new Metropolitan Opera House; Louis F. Austin, a Brooklyn-born journalist who was Henry Irving’s private secretary; poet David L. Proudfit; and drama critic William “Willie” Winter.1 Two small drawings provide a charming touch—a cat drawn by playwright Henry Guy Carleton, and an owl by artist and engineer F. Hopkinson Smith who was then busy completing the base for the Statue of Liberty which was scheduled to arrive within the next two months. Beecher was then one of the most famous men in the country. 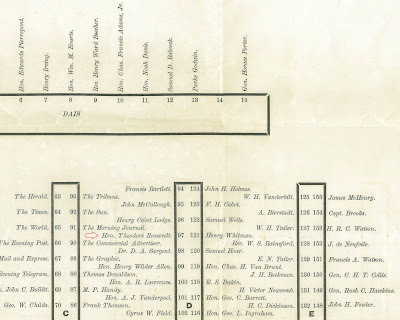 A gifted orator at the Plymouth Church in Brooklyn Heights, he became one of the city's tourist attractions; the ferries that crossed the East River from Manhattan were dubbed “Beecher Boats.” He had been an influential voice on the national scene for decades. Before the Civil War, he strongly denounced slavery, a cause he shared with his sister Harriet Beecher Stowe, author of Uncle Tom’s Cabin. Beecher also promoted other social issues like women’s suffrage and temperance, and supported Darwin’s theory of evolution, one of the hottest topics of the Victorian era. Accused in 1872 of seducing one of his parishioners, Beecher endured a sensational civil trial that created more headlines than the entire Civil War.2 In the end, he survived the salacious scandal and remained a popular after-dinner speaker, despite his tarnished reputation. 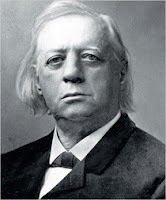 Although he was a familiar sight on the banquet circuit, some of the attendees may have been startled to see him rise to his feet to honor an actor, for Beecher had always been against the theater, believing that it was not conducive to the Christian way of life. After receiving a full minute of applause, Beecher began his speech by acknowledging that some might be surprised to see him there. Raised by stern Puritan parents, he recalled how he had been taught him that the theater was the home of the devil, that an actor was an irredeemable creature, and that an actress was beyond all words. After reaching the age of seventy, however, he decided to go and see for himself. After taking his first bite of the forbidden fruit, he was now eating all the apples he could get, having now attended seven or eight performances at this point. Displaying his characteristic wit, Beecher recalled that he had recently been asked whether he still thought the theater was harmful for young Christians. He answered by explaining that it might not be too detrimental, as long as they followed his example and waited until they were seventy before attending. Concluding his speech on a maudlin note, Beecher said that Irving’s departure gave him the feeling that he usually got in autumn, when the birds were migrating and he did not know whether he would ever hear them sing again. With that, the great orator took his seat as the room erupted into loud cheers and prolonged applause. The other person the attendees may have been surprised to see that evening was Theodore Roosevelt. On Valentine’s Day of the previous year, his mother died of acute typhoid fever and his twenty-two-year-old wife died of kidney disease, within hours of each other in the same house on 57th Street. 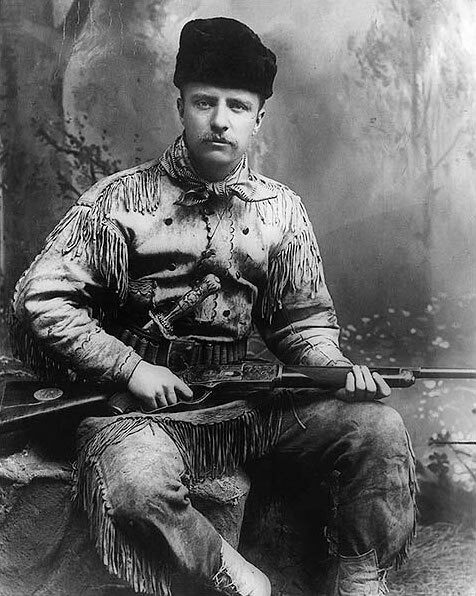 Crossing out that day in his diary, Roosevelt wrote, “The light has gone out of my life.” He quickly departed for his ranch in the Badlands of the Dakota Territories, and was now only temporarily back in town to finish Hunting Trips of a Ranchman. 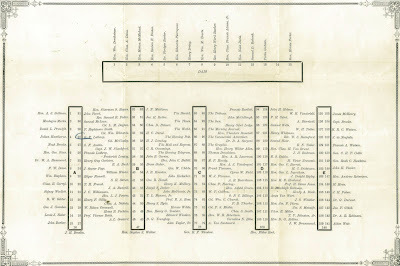 Looking pale and dyspeptic, Roosevelt worked so hard on the book that his sisters became worried, making inquiries about his health.3 The seating chart shows that he was seated at Table “D,” next to his good friend Henry Cabot Lodge, the reform-minded Republican politician from Massachusetts. The correspondent from the Times, sitting a few feet away at the next table, reported that Roosevelt and Lodge kept up an “animated conversation” all evening. As was so often the case, Roosevelt exhibited amazing energy and exuberance, even when in a weakened condition. Ten days after this dinner, he returned to the Dakotas and did not come back to New York until the summer of 1885. By then, his health was fully restored. It was then that he first saw Sagamore Hill, his newly-completed home at Oyster Bay. 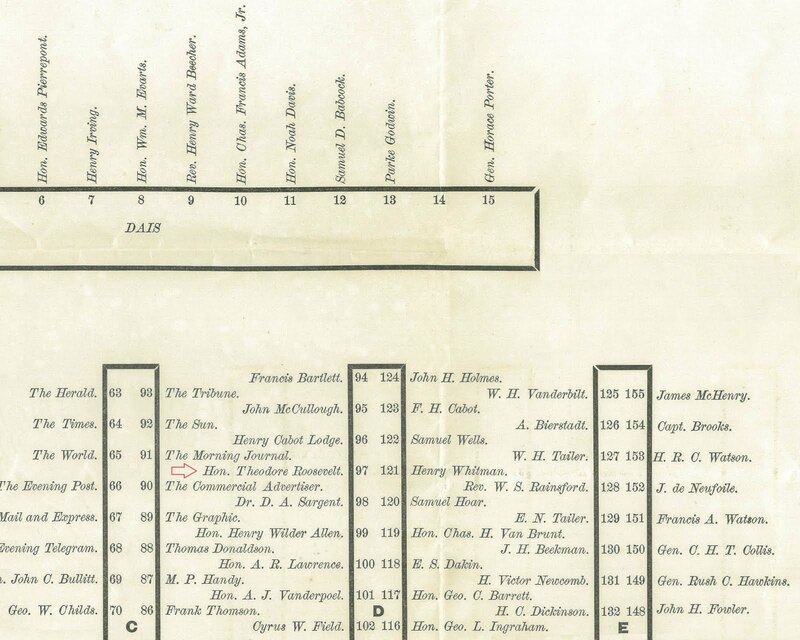 In October 1886, Roosevelt ran for mayor of New York and lost, coming in third. (The setback coincided with the dedication of the Statue of Liberty.) A few weeks later, he sailed to London to marry Edith Carow, as his new life began to take shape. We may never know what Roosevelt and Lodge were discussing that evening, nor we will ever be able to appreciate Beecher’s oratory skills, given the transient nature of his art. Two days after the banquet, Henry Irving sailed for Liverpool, vowing that this American tour had been his last. Nevertheless, the celebrated actor returned many more times to perform in the United States. So many, in fact, that Chef Ranhofer eventually named a stuffed chicken dish after him—poulet farci et grillé à la Irving. 2. Debby Applegate, The Most Famous Man in America: The Biography of Henry Ward Beecher, New York, 2006. 3. Edmond Morris, The Rise of Theodore Roosevelt, New York, 2001.